Is Movado Group, Inc (MOV) A Good Stock To Buy? The worries about the election and the ongoing uncertainty about the path of interest-rate increases have been keeping investors on the sidelines. Of course, most hedge funds and other asset managers have been underperforming main stock market indices since the middle of 2015. Interestingly though, smaller-cap stocks registered their best performance relative to the large-capitalization stocks since the end of the June quarter, suggesting that this may be the best time to take a cue from their stock picks. In fact, the Russell 2000 Index gained more than 15% since the beginning of the third quarter, while the Standard and Poor’s 500 benchmark returned less than 6%. This article will lay out and discuss the hedge fund and institutional investor sentiment towards Movado Group, Inc (NYSE:MOV). Movado Group, Inc (NYSE:MOV) shares didn’t see a lot of action during the third quarter. Overall, hedge fund sentiment was unchanged. The stock was in 19 hedge funds’ portfolios at the end of the third quarter of 2016. At the end of this article we will also compare MOV to other stocks including FutureFuel Corp. (NYSE:FF), Hortonworks Inc (NASDAQ:HDP), and Editas Medicine Inc (NASDAQ:EDIT) to get a better sense of its popularity. How have hedgies been trading Movado Group, Inc (NYSE:MOV)? At the end of the third quarter, a total of 19 of the hedge funds tracked by Insider Monkey were bullish on this stock, unchanged from the previous quarter. 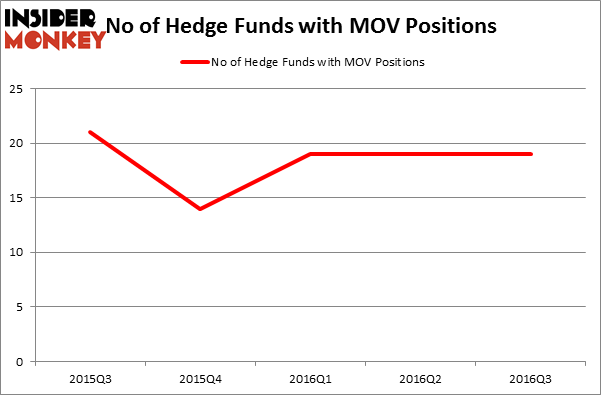 Below, you can check out the change in hedge fund sentiment towards MOV over the last 5 quarters. So, let’s see which hedge funds were among the top holders of the stock and which hedge funds were making big moves. 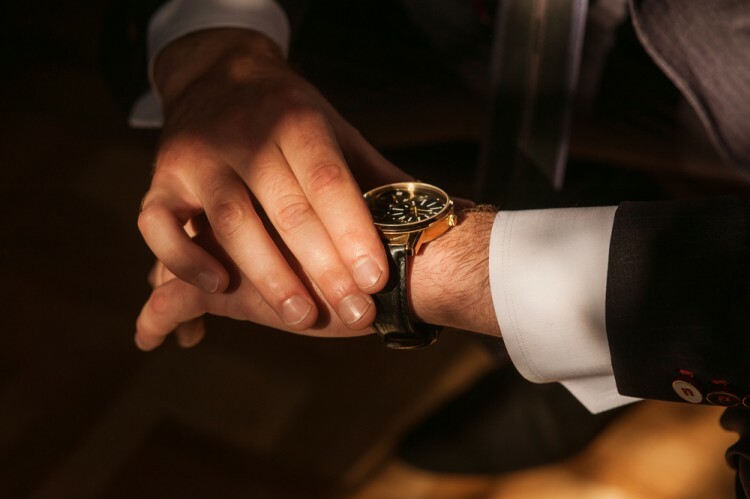 According to publicly available hedge fund and institutional investor holdings data compiled by Insider Monkey, Chuck Royce of Royce & Associates holds the biggest position in Movado Group, Inc (NYSE:MOV). Royce & Associates has a $25.2 million position in the stock. Sitting at the No. 2 spot is Cliff Asness of AQR Capital Management holding a $5.2 million position. Some other hedge funds and institutional investors that hold long positions encompass John W. Rogers’ Ariel Investments, Paul Hondros’ AlphaOne Capital Partners and Murray Stahl’s Horizon Asset Management. We should note that none of these hedge funds are among our list of the 100 best performing hedge funds which is based on the performance of their 13F long positions in non-microcap stocks. Helen of Troy Limited (HELE): 73% Surge in Smart Money Ownership; What’... Is Vitamin Shoppe Inc (VSI) Going to Burn These Hedge Funds? Is It Time to Buy Ultra Clean Holdings Inc (UCTT)? Smart Money Thinks So. Is Cabot Corp (CBT) A Good Stock to Buy? Vince Holding Corp (VNCE): Hedge Funds Keep Heading Elsewhere Should You Get Out of UniFirst Corp (UNF) Now? Hedge Funds Are.